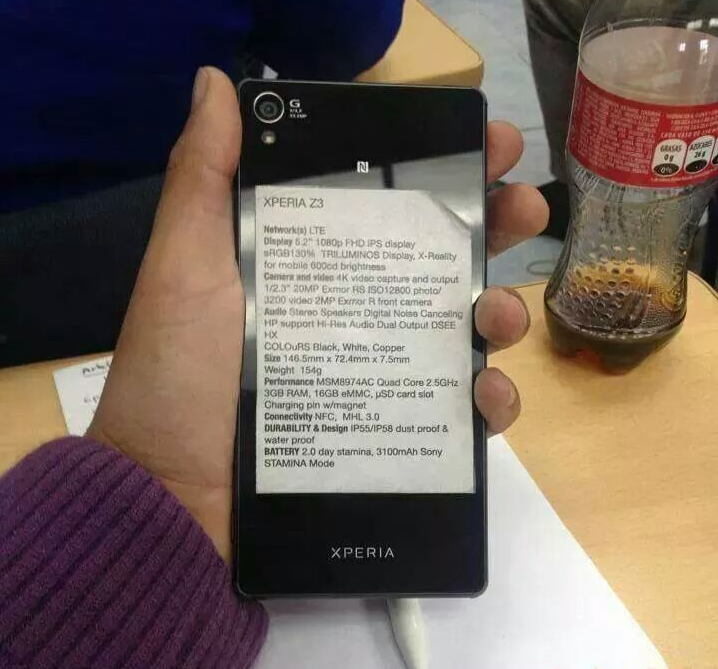 With barely a few days left for IFA, pretty soon we’ll be able to get our hands on Sony’s upcoming Xperia Z3. That hasn’t stopped an unknown tipster from taking a snapshot of complete specs for the device. Or rather, it’s a picture of the device, with full specifications taped on it’s back. So much for creativity. The list ends up confirming what we already know about the device courtesy of numerous leaks so far. Outdoor visibility on the device will rival that of the Galaxy S5 at a rating of 600 nits at peak brightness. The Xperia Z3 should therefore be great for outdoor visibility. This latest leak gives the Xperia Z3 a significant boost over it’s predecessor in terms of processing power. As opposed to previous speculations, looks like Sony will be launching the Xperia Z3 with the MSM8974AC – which for the uninitiated is the Snapdragon 801, similar to that on the Galaxy S5. This will be coupled with 3 GB RAM and 16 GB internal storage on the device. Exmor sensor is another thing that will be present on both the rear and the front of the device. The rear camera of the device will be 20 MP with 4K video and ISO 3200 and ISO 12800 for still photos. These are similar to the ones found on the Xperia Z2. Dimensions of the device show an interesting change. The Xperia Z3 will be both slimmer and less wider than the Xperia Z2. In addition, the battery on the device will be 3100 mAh as compared to the 3200 mAh on the Xperia Z2. How well this combines with the Snapdragon 801 is anyone’s guess at this moment. The Xperia Z3 will also be dust and waterproof, courtesy of the IP55 and IP58 found on the Xperia Z2. How well this all translates we’ll found out within days. Rest assured, the Xperia Z3 won’t be lacking in any significant department.